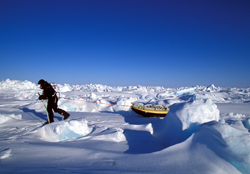 This guide is made for full length unsupported expeditions. If you choose aid such as kites, airdrops of supplies or to fly over troubled areas, other rules apply. For kiting, you might prefer to travel with a backwind and thus arrive at Antarctica from the South African starting point. Kiting is easy and convenient as you don't have to pull your heavy sled and can expect to cover 3 times the normal distance in one day. Airdrops will change your journey entirely. Forget cold tents, slow and heavy travel, freezing rest days, no change of clothes, hairy preparations in terms of which backups to bring and which to leave behind, and the battle for supplies to last. The route will be easier because you'll be faster, and your schedule more forgiving. What you forgot you can order, broken skis are replaced with new ones and there will be a fried chicken thrown in for good measure too. If you had a good guide, you'll arrive at the pole rosy and fresh without even the smallest sign of frostnip. It is common even to gain weight! While supported polar treks deserve respect in their own right – it is not a weekend trip in Colorado we are talking about here, they simply doesn't compare to unsupported travel in terms of challenge.